Make plans to attend this popular event and enjoy A Taste of Perdido April 4-5 when the Perdido Key Wine and Art Festival welcomes spring to the scenic barrier island. The event, complete with arts and crafts vendors and live music, will be held inside and outside the new Visitor Information Center, 15500 Perdido Key Drive, overlooking the beautiful Gulf of Mexico. "A Taste of Perdido Under the Stars" VIP event, features local restaurants serving samples of their signature dishes paired with tasty wines, live entertainment and a special featured artist. Tickets are $25 per person/$45 per couple. Dress is resort casual. 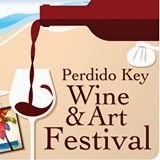 Fifth Annual Perdido Key Wine & Art Festival. For $15, guests will receive a commemorative wine glass and five tasting tickets. Additional tickets available for purchase. The event will feature live entertainment and arts and crafts vendors. Wine will be available to purchase by the bottle or the case.